Findings in mice show pill for breast cancer diagnosis may outperform mammograms A new kind of imaging could distinguish aggressive tumors from benign, preventing unnecessary breast cancer treatments. As many as one in three women treated for breast cancer undergo unnecessary procedures, but a new method for diagnosing it could do a better job distinguishing between benign and aggressive tumors. Researchers at the University of Michigan are developing a pill that makes tumors light up when exposed to infrared light, and they have demonstrated that the concept works in mice. Mammography is an imprecise tool. About a third of breast cancer patients treated with surgery or chemotherapy have tumors that are benign or so slow-growing that they would never have become life-threatening, according to a study out of Denmark last year. In other women, dense breast tissue hides the presence of lumps and results in deaths from treatable cancers. All that, and mammograms are notoriously uncomfortable. The move could also catch cancers that would have gone undetected. Thurber’s team uses a dye that responds to infrared light to tag a molecule commonly found on tumor cells, in the blood vessels that feed tumors and in inflamed tissue. By providing specific information on the types of molecules on the surface of the tumor cells, physicians can better distinguish a malignant cancer from a benign tumor. Compared to visible light, infrared light penetrates the body easily—it can get to all depths of the breast without an X-ray’s tiny risk of disrupting DNA and seeding a new tumor. Using a dye delivered orally rather than directly into a vein also improves the safety of screening, as a few patients in 10,000 can have severe reactions to intravenous dyes. These small risks turn out to be significant when tens of millions of women are screened every year in the US alone. But it’s not easy to design a pill that can carry the dye to the tumor. “To get a molecule absorbed into the bloodstream, it needs to be small and greasy. But an imaging agent needs to be larger and water-soluble. So you need exact opposite properties,” said Thurber. Fortunately, they weren’t the only people looking for a molecule that could get from the digestive system to a tumor. The pharmaceutical company Merck was working on a new treatment for cancer and related diseases. They got as far as phase II clinical trials demonstrating its safety, but unfortunately, it wasn’t effective. The targeting molecule has already been shown to make it through the stomach unscathed, and the liver also gives it a pass, so it can travel through the bloodstream. The team attached a molecule that fluoresces when it is struck with infrared light to this drug. Then, they gave the drug to mice that had breast cancer, and they saw the tumors light up. This work was done in collaboration with David Smith, the John G. Wagner Collegiate Professor of Pharmaceutical Sciences in the College of Pharmacy, and a member of the Comprehensive Cancer Center. The study was supported by the Foundation for Studying and Combating Cancer and the National Institutes of Health. ‘Nightmare bacteria:’ Michigan Engineers discuss how to combat antibiotic resistance Drug-resistant bugs are on the rise and new approaches are needed. Health officials at the U.S. Centers for Disease Control and Prevention earlier this month said they are seeing rising cases of “nightmare bacteria” that show strong resistance to antibiotics. More than 200 cases were reported in the last year alone, and across every state in the U.S.
“Unusual resistance germs—which are resistant to all or most antibiotics tested and are uncommon or carry special resistance genes—are constantly developing and spreading,” the CDC said. A particular concern is the number of cases that crop up in hospitals and nursing homes where IVs, catheters and medical implants—all particularly susceptible to infection—are common. “Antibiotic resistance is one of the most important public health problems of the 21st century,” said Angela Violi, professor of mechanical engineering and chemical engineering at U-M.
Violi is one of many researchers at Michigan Engineering who are are tackling this issue from a variety of angles. Some are exploring new ways to combine antibiotics to stay one step ahead of the bugs. Others are looking beyond antibiotics—to nanoparticles. Nicholas Kotov, the Joseph B. and Florence V. Celka professor of chemical engineering, is part of a team researching the use of nanoparticles as a new form of antibiotics. Nanoparticles can be shaped specifically to get past a bacterium’s defenses and shut down processes essential to its survival. Nanoparticles can also be used to coat medical implants in order to prevent infection from drug resistant bacteria. Violi helps identify the best pathways for utilizing nanoparticles to attack antibiotic resistant bacteria. “Potentially, all it takes is a single mutated bacterium to render an antibiotic useless for that infection,” she said. “When that mutant cell replicates, it will pass on its resistant phenotype to its daughter cells, and so on. “At that point part of the replicating bacteria will be drug resistant: the drug will kill only those cells that do not have the newly evolved drug-resistance capacity. Eventually, the entire bacterial population will become resistant to the prescribed antibiotic. “It is only when antibiotics are used that drug-resistant phenotypes have a selective advantage and survive. Sriram Chandrasekaran, an assistant professor of biomedical engineering, approaches drug resistant bacteria from a different angle. 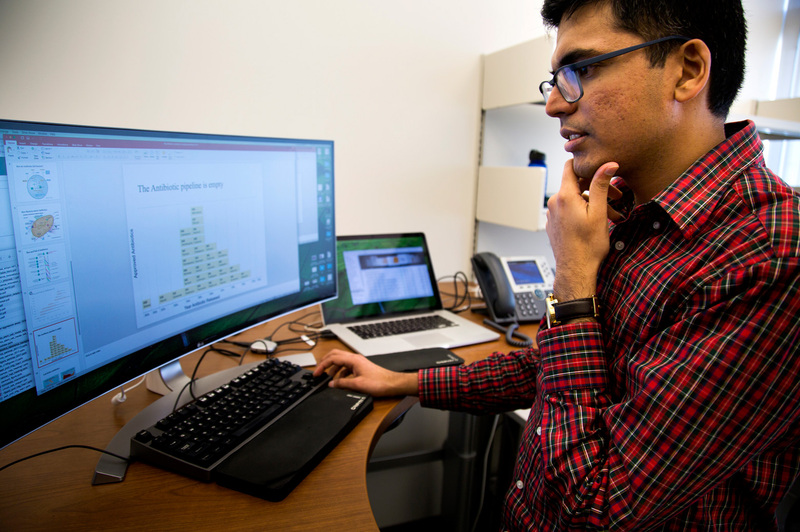 He and his team study proteins and analyze their behaviors via computer simulations to develop strategies for using current antibiotics in combination as well as roadmaps for creating new classes of antibiotics. “In addition to better stewardship of antibiotics, we also need to come up with smarter treatment strategies that can reduce the rise of resistance,” Chandrasekaran said. “For example, our lab and others are designing combinations of antibiotics that are more effective in retarding the evolution of drug resistance compared to using drugs individually. Such combinations of FDA approved drugs can also reach the clinic faster than developing new drugs from scratch. Bionic heart tissue: U-Michigan part of $20M center Scar tissue left over from heart attacks creates dead zones that don’t beat. Bioengineered patches could fix that. Ramcharan and her colleagues in Lahann’s lab will help design and produce a polymer-protein construct that mimics the 3D matrix connecting the cells in human heart muscle. Heart muscle cells moving into this environment will then be able to link up into a single tissue. Photo: Joseph Xu, Michigan Engineering Communications & Marketing. Stacy Ramcharan, a doctoral student in chemical engineering, uses a computerized system to layer polymer fibers, forming a scaffold for growing cells into artificial tissues. Photo: Joseph Xu, Michigan Engineering Communications & Marketing. Header Image Caption: Scar tissue left behind after a heart attack can’t beat again, but bionic heart muscle patches, the goal of a new $20M center, could pick up the slack. Courtesy Getty Images.